Here is what Eloise does in Paris: everything. The effect is rawther extraordinaire. If you come to Paris with Eloise you will always be glad you did. 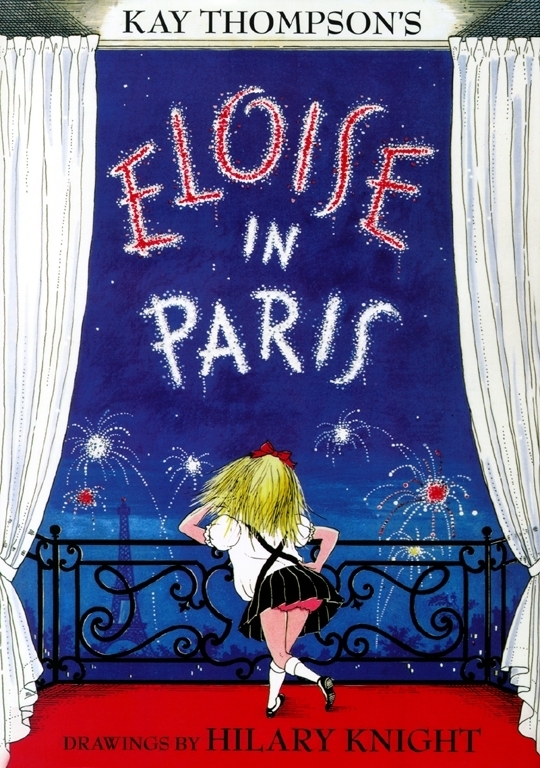 Eloise in Paris was first published in 1957, the second of the Eloise quartet, and an immediate bestseller. Kay Thompson and Hilary Knight traveled to Paris to research the book, and the illustrations are dotted with the celebrities they knew there: Richard Avedon takes Eloise's passport photograph; Christian Dior prods her tummy, while his young assistant, Yves Saint Laurent, looks on; Lena Horne sits at an outdoor café. All four Eloise books by the late Kay Thompson and Hilary Knight -- Eloise: The Absolutely Essential Edition, Eloise in Paris, Eloise at Christmastime, and Eloise in Moscow -- are now being reissued by Simon & Schuster. Kay Thompson (1909–1998) was a singer, dancer, vocal arranger, and coach of many MGM musicals in the 1940s. The Eloise character grew out of the voice of a precocious six-year-old that Miss Thompson put on to amuse her friends. Collaborating with Hilary Knight on what was an immediate bestseller, Kay Thompson became a literary sensation when Eloise was published in 1955. The book has sold more than two million copies to date. Kay Thompson and Hilary Knight created four more Eloise books, Eloise in Paris, Eloise at Christmas, Eloise in Moscow, and Eloise Takes a Bawth. Hilary Knight, son of artist-writers Clayton Knight and Katharine Sturges, was educated at the Art Students League, where he studied with Reginald Marsh. Besides the Eloise books, Hilary Knight has illustrated more than fifty books for children, six of which he wrote himself. He lives and works in New York City, not far from The Plaza Hotel.